Teresa Lewis executed - Right or Wrong? 41-year-old Teresa Lewis pleaded guilty and was convicted of getting two men to kill her husband and stepson to cash in on their life insurance policy. The two hitman have both been jailed for life, but were not sentenced to death. The main question lies over whether she was mentally fit to stand trial? Campaigners have said that as she had an IQ of 72, she had diminished mental capability, but she was passed capable enough to stand trial. The details of the trial are messy. She hired two men to carry out the killings and started an affair with one of them, with defendants are saying that she was manipulated by one of them into carrying out these actions. So, what do you think, should she have been put to death or reprieved? What about the two killers, should they also have received death sentences, or just the life imprisonment? Even if it could be proven that her punishment will be a deterrent to some, it is still as wrong as can be. Same. What her IQ had been is irrelevant to me because of that. I simply don't think the state should execute people. Fri, 09/24/2010 - 15:02 â€” What Exit? If you are anti-death penalty of course it is wrong. If you are not against the death penalty she seems to qualify. Even if her IQ is only 72 (and we all know IQ overall is not really a great measure) she showed plenty of guile and planning and should pay for her crime like anyone else. If that means life imprisonment or death penalty it is just. I don't really care that much about the death penalty. I don't think it really works but I am not really against it either. The killers should be eligible for the same penalty she is. Her crime seems a bit worse but killers for hire are clearly not people that should be at large. So life in prison or death seem like the only answer. 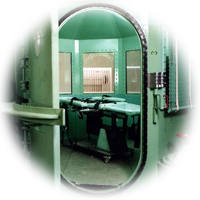 I am anti-death penalty because I don't think our legal system is set up to handle it justly. "Teresa Lewis is a poster child for why the death penalty process is broken." No, not really. And I bet the Telegraph doesn't write such smooshy articles about men who get executed. The fact that she was a woman (and a grandmother!) just keeps being brought up in inappropriately sensationalistic ways. Yes, we're all aware that Teresa Lewis was a woman. You don't need to remind us of this fact in every paragraph. I have grave reservations about this case, because of the dichotomy between the sentences for the hitmen and the woman involved. At the risk of falling into gender politics, I can't help but think that the sentence is punishment above and beyond the nature of the crimes that she was convicted of - rather a punishment for a woman who dared to flagrantly violate the normal standards of male/female behavior. Jim brings up the question of who is more reprehensible: the person who contracts a killing, or the person who contracts to do the killing. In my opinion there's really no difference. Whatever the contract seeker may gain in reprehensibility for "cowardice, in not being able to kill themselves," or "betrayal of family," the contractees gain in their willingness to kill complete strangers without any personal, potentially extenuating motivations. Certainly I figure the contractees are more of the threat, and more likely to be willing to repeat their crime. If only because when you start killing family, it really tends to remove future potential victims. Since I tend to view capital punishment, if it has any concrete value, as a sure-fire method to prevent recidivism, ISTM that executing the contract killers would be both more just and more logical. Further, I have come to oppose the death penalty, because I am sickened by the way that social class affects sentencing in our nation - but I don't have a philosophical problem with the idea of the state executing convicted felons. Certainly I believe that if this woman had had any kind of private money she'd have faced, at worst, life in prison. I feel that the gravest injustice here is not that Teresa Lewis was executed, but that her sentence was so divergent from that of the people whom I feel should be considered to be at least equally culpable. She was smart enough to hire hitmen. Just sayin'. OtakuLoki There are two things about the contract killer/employer dichotomy. Employer: Provides the motive and has a relationship with the victim. So I think it's pretty much equal since the Contractor is committing a murder, and the Employer is deciding who gets murdered and is often committing a betrayal, as in this case. My thinking on the issue tends towards this as well. Whatever is deemed the just punishment should probably be the same for both the employer and the contractor. While their crimes are somewhat different, they're equally reprehensible.